1890: male and female attendants provided daily care for the patients. There was one attendant for every 10 patients. 1897: a nurse was hired to care for physically sick patients in the Hospital’s infirmary. 1918: first occupational therapy activities. A carpentry workroom was set up for the exclusive use of ex-WW1 soldiers who were patients. 1920: a “vocational instructress” was hired to teach basket weaving. Mid-1920s: over 400 occupational therapy classes were given in handicrafts, with an average attendance of 50 patients per class. A group of articles were sent to the Canadian National Exhibition in Toronto, where ten prizes were received one year for excellent work. The department also sold occupational therapy items at the T. Eaton Co. Store. Early 1940’s: the Hospital’s first rigorous research project: assessing the value of blood for transfusion after storage, for use in the battlefield by the Canadian Army. 1942: many staff left for war duty. The Hospital relied on patient volunteers as never before to run an institution of 1,479 patients. Postwar rise in profile of psychiatry: Psychiatrists were increasingly recognized during World War II for treating and rehabilitating service personnel with emotional disorders. This gave psychiatry a great boost as a profession. 1946: first chaplain. Church services of various denominations continued to be held on Sundays in Douglas Hall. The addition of a chaplain, however, allowed individual patients to be visited and receive personalized spiritual guidance. 1947: first long-term social worker. A social worker had been hired in 1926, but left soon after and was not replaced for over twenty years. 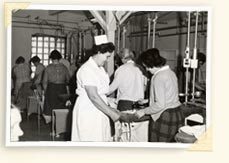 In 1958, the first Long Service Award Dinner was held to honour staff who had worked at the Hospital for a number of years. At the first dinner, 19 staff were awarded for 15 years of service and 7 for 25 years of service. The Douglas family, after whom the Hospital is named, traditionally honoured the award-winners by providing cocktails for the event. In 1970, a computer was used for the first time to prepare staff cheques. Prior to this, all hospital cheques were handwritten! The computer at Sir George Williams University (now part of Concordia University) was first used for this purpose.